Most of us have run into a situation where we find ourselves scrambling to recover files from a flash memory card, or a hard drive. I’ve found myself running into this issue a few times in my career, and it’s something that comes when you least expect it, and always when you’re in a rush! When you are in that predicament, relax and get Data Rescue to help you out, but don't shoot over those files! One time it was a faulty card reader that disconnected my card in mid transfer and it shorted the card so that it was showing up as blank when I put it back in. Another time it was my fault when I had recently purchased two new identical CF cards and mistakenly formatted the wrong one. 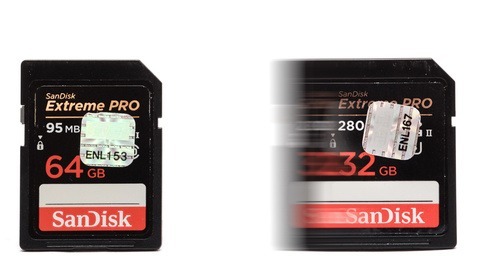 The beauty of flash memory cards is that formatting a card doesn’t actually get rid of the information, it just masks it and allows for it to be written over. What this means is that if you filled up a card with images, and then you formatted it, the card is still filled with images, but the camera doesn’t register them so it can overwrite the information. This is where the important part comes in. 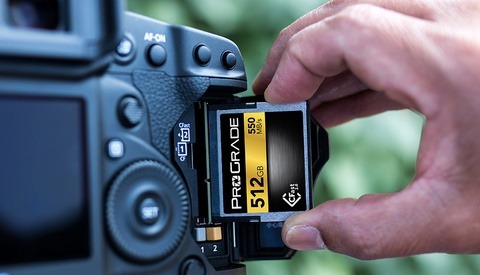 Sure the images are still there even if you format the card, but if you start shooting with that card, then those images are being overwritten, and they are being permanently lost one at a time as you continue to shoot. For example, if you shoot 500 images on one card and it’s full, and then you format it, you are left with space for 500 images. Then you shoot 50 images and before you realize what you’ve done, you’ve just lost approximately 50 of those 500 images permanently because you’ve overwritten the data. The other 450 can be saved with data recovery software. So, let’s get in to what to do if you find yourself in this situation. Here are 3 things I suggest you do in order to get the most photos back possible. 1) Stop using the card immediately! You need to do whatever you can to save as many files as possible, so don’t shoot on that card anymore. 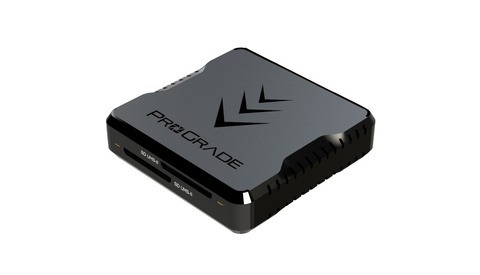 2) Use a good card reader and connect your card to your computer. If your card isn’t being picked up by the computer, you can put it back in your camera and format it so that it’s readable. Remember, formatting is OK because you’re going to use the recovery software to get the images back. If this still doesn’t work and the camera and the computer are still not reading the card, you can try plugging the card into your computer and with it still plugged in, restart your computer. Sometimes this will initialize the card to be readable. If that's not working, you're going to have to bring the card to a computer store in your area, or send it off to the manufacturer. 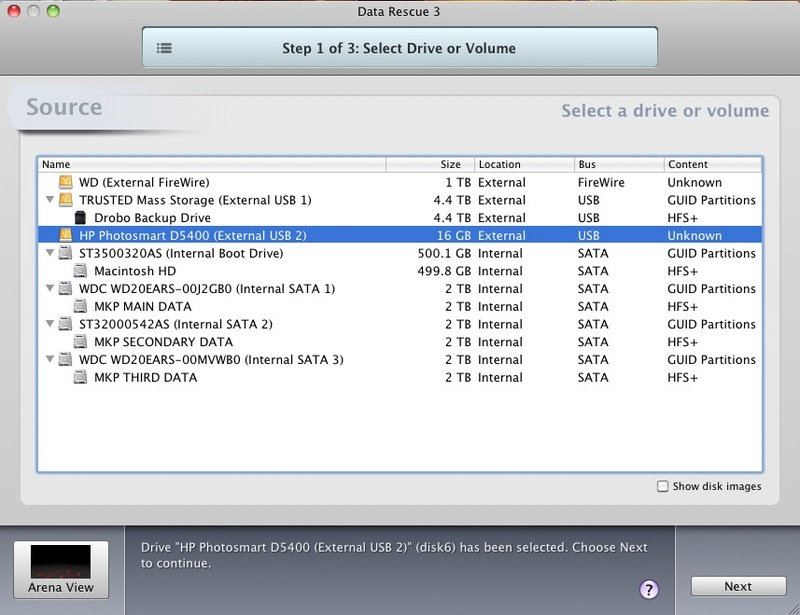 3) Use a good data recovery software and recover the files. 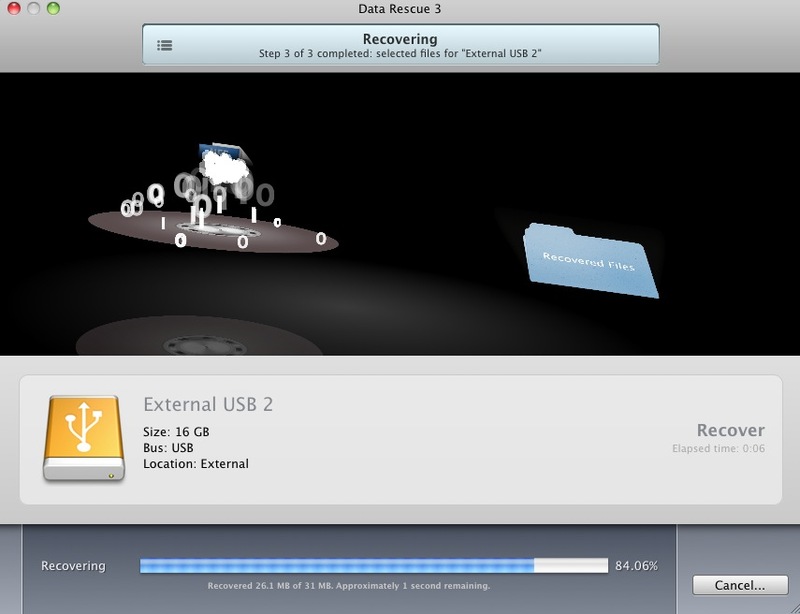 I suggest you look in to using Data Rescue 3. This is not a free product, but the $100 you spend on this will likely save you way more than that because of the situation you’re faced with. Also, you can ask on your local photographer groups if anyone has the program and would be willing to help you out. Just offer to buy them a drink! If you’re not part of a great Facebook group with people that are willing to help out, then I would suggest you look in to joining one of the local Shoot & Share groups in your area. 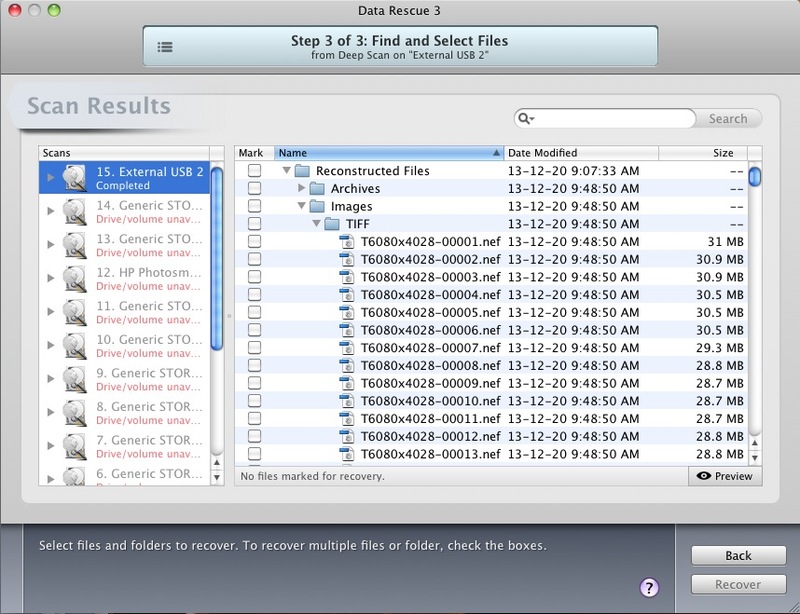 Just so you have a good idea of the process involved, here is a quick run through of using Data Rescue 3. This will be a very similar process for any recovery tool. If you're on a PC, here's an alternative you can look in to that's free. There are many others that you can find from a quick Google search. 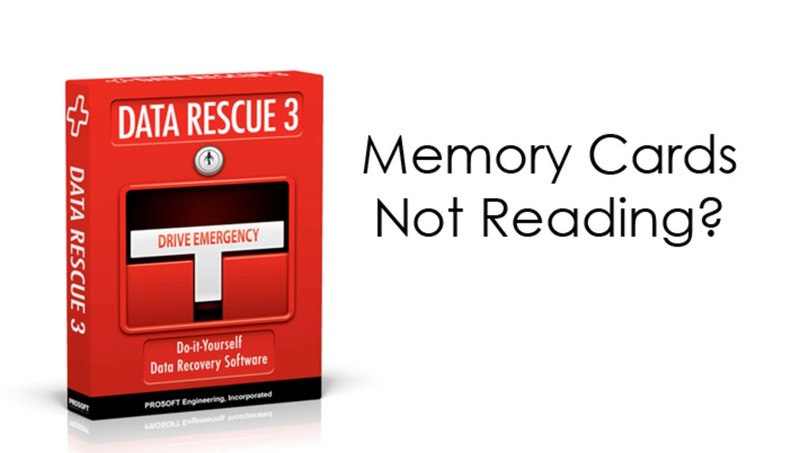 First, open Data Rescue 3 and plug in your memory card. Click on the card that you’re wishing to recover images from and select next. 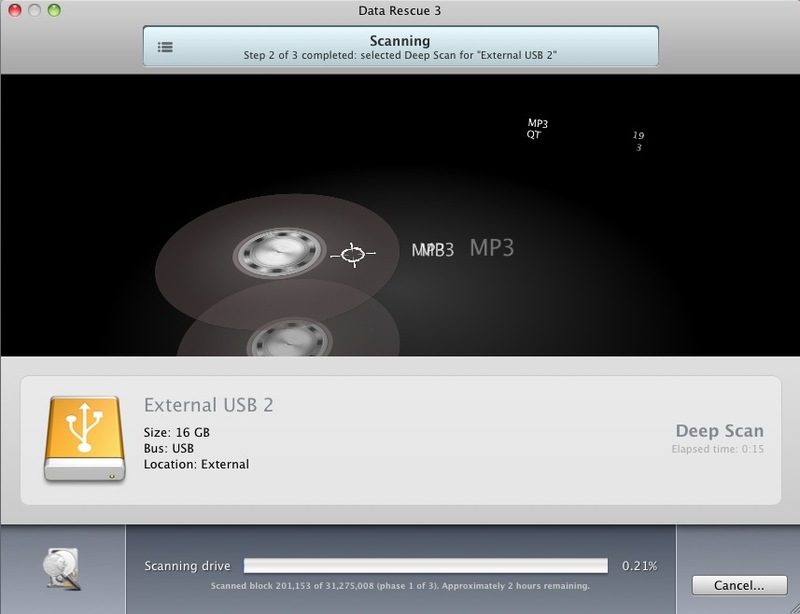 Select “Deep Scan” and click start, then allow the program to scan the drive for all files. Find the folder that contains the files you wish to recover. In this case, I’m looking for the TIFF folder, as that’s where the RAW files are kept. Then let the program recover the files to the folder you’ve selected. Once you have this completed and the RAW files are ready to be used, you can drag them into Lightroom so you can view the images and sort through them. You’ll find that the file names have been stripped, but all of the metadata stays in tact, and you can arrange the files by capture time for easy sorting. If you would like to purchase ProSoft Data Rescue 3 you can do so in the Apple store or through CNet. If you’re in Canada, I suggest you purchase through CNet as it’s $20 more expensive in the Canada Apple Store. Would maybe be nice to either (a) suggest a Windows alternative, or (b) note at the beginning of this article that it's a Mac only solution, so people like me don't read the whole thing and then get frustrated. I lost a 32gb card of raws right after a wedding. Every wedding photographers nightmare! Found LC-tech.com through trolling posts and the service was great fast and affordable! I used Pandora recovery. it was free. I'm a professional photographer and fortunately have never had a card fail.... until I was just at Disney World with my kids for the first time, and now couldn't see or download ANY of the photos to my computer. Put the card back in the camera and get an error message. I was completely devastated. I tried recovery software, and anything else I could think of... nothing worked. Finally decided to send it to a data recovery place to see if they could help. The most reasonably priced option was in Germany. I was reluctant to send the memory card so far, but I had nothing to lose (after all, my data was already lost!). The company is called Recoverfab. www.recoverfab.com. He breaks down the possible problems and is very straightforward with everything. Shipped the card, got receipt confirmation, and then much to my shock I received word that we has able to recover ALL 560 of my photos! Memories saved! I highly recommend that site. And here's another perk... You don't pay if he can't save your data!! I'd be happy to answer any questions you might have about my experience. I still can't believe I got my photos back. I suggest you use software that can work with disk images and scan those rather than the original card. Number one rule in data recovery: get a disk image. Win32 disk imager will do it for free: https://sourceforge.net/projects/win32diskimager/files/latest/download.